We’re entering a very exciting age of web design. I’ve never hidden my opinion on Flash on this blog or on any other online outlet — I think it’s an abomination that should be used solely for cross-platform games and other niche cases — but without an alternative, I’m also using it for video on my blog. On that note, I’ll soon start using the <video> element for all video on my blog. To support Opera and Firefox, all media will be available in H264 and OGG formats. I’ll be very happy when I can say I’ve banished the scourge of Flash from all my websites. Hat tip to Wolfgang Bartelme for sharing Snow Stack on Twitter. Wow, that’s very impressive. By the way, I think something went wrong with your post, it seems some text is missing. Erm, oops. I didn’t use entities for the video tag, so it handled it as a regular video tag. Fixed. Thanks for the heads up on this. I’d love to hear more about your plans and methods for incorporating video onto your site. I keep going back and forth between QT and Flash on my own site. Very Impressive. Wishing i had show leopard! Definitely check out Video for Everybody (http://camendesign.com/code/video_for_everybody) if you plan to start serving video via HTML5. webkit is the development version of Safari. it has all new css transform 3D and gpu deported graphical work working with Leopard, even if snow leopard allows better framerate. TIP: Ypu don’t need Snow Leopard to view the demo!!! 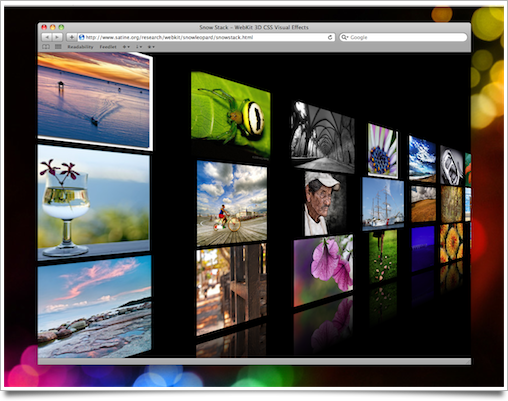 You can also view the demo if you get the latest version of the nightly build Webkit browser! I just had to comment on this post. I am normally a big fan of your work and your views on design, but I find your fervent hatred of Flash offputting. Flash is certainly not perfect, but it is and has been the best way for passionate interactive designers to truly push the boundaries of online interactivity for a long time. 95% browser compatibility, seamless support for advanced web typography, and dynamic motion and interactivity put it far beyond the capabilities of even the advanced CSS and HTML demos that have people drooling these days. The major problems with Flash are poor support from Adobe, and the adoption by people who don’t know how to properly use the power it provides. I, too, am a huge supporter of web standards. I would love to see these things become a reality, but the very things that people will eventually be creating with these new standards-based technologies will be the same things you now hate so much about Flash. Keep up the good work. And this is a really cool demo. Please, not Ogg. You should be supporting standards first and foremost, way above your desire to stop using browser plug-ins, which like it or not are still with us and will be for a little bit yet. The audio video standard is ISO MPEG-4 H.264/AAC and it is almost 10 years old and it is very, very widely supported. MPEG-4 is so widely supported that even the Zune supports it, and Microsoft has their own proprietary alternatives which they used to push. Other players that support MPEG-4 are iTunes, iPod, iPhone, Blackberry, Pre, Nokia S60, Android, QuickTime Player, FlashPlayer, Blu-Ray, and 2 billion feature phones (3GPP is part of MPEG-4). You can make MPEG-4 with Flip or other camcorders, and with the iPhone 3GS camcorder. YouTube is MPEG-4, no matter what format you upload in, it comes back as MPEG-4 in FlashPlayer on the desktop or MPEG-4 natively on smart phones. You can edit or encode MPEG-4 in all consumer or professional video tools. None of this exists for Ogg. You will not even benefit your Firefox and Opera users with Ogg, because these users exist in the same world of multiple devices that we all do. They have many, many audio video players in their possession right now, and all play ISO MPEG-4. They not only want to see your video in their browser, they want to see it in their feed reader, they want to put it on their iPod, they want to share it with a friend who also has multiple MPEG-4 players from many manufacturers and in many form factors. When you consider that the Firefox and Opera users have been viewing MPEG-4 inline in their browser for the past 3 years in FlashPlayer plug-in and for the past 8 years in their QuickTime Player plug-in, it’s not only a drag to remove all the benefits of standardization from them, it’s unnecessary in the extreme. The same MPEG-4 that plays everywhere else plays in Firefox and Opera via either FlashPlayer or QuickTime Player. Amazing stuff. I am so impressed with the direction HTML, CSS and Jscript are going.